The Nigerian Army on Monday said Operation Crocodile Smile II, which is the military exercise for the Niger Delta region, will commence on Saturday. The army said Operation Crocodile Smile II, which will be carried out by troops of the 6 Division, Nigerian Army, Port Harcourt, Rivers State, will cover mainly the four states of Akwa Ibom, Bayelsa, Delta and Rivers. The army operation in the South-East states – Operation Python Dance II – which started on September 15 and will last till October 14, generated a lot of controversies with the alleged invasion of the residence of the Indigenous People of Biafra’s leader, Nnamdi Kanu. 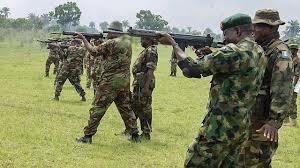 Iliyasu said, “Troops of 6 Division, Port Harcourt, and its units covering the Niger Delta states of Akwa Ibom, Bayelsa, Delta and Rivers will conduct Exercise Crocodile Smile II from October 7 to 28. The exercise is intended to train troops in operational, logistics as well as civil-military cooperation aspects.